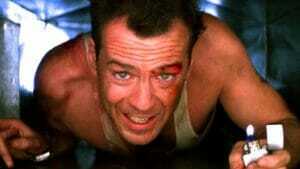 So many people love Christmas movies but there is great debate over whether “Die Hard” fits in that category. I happen to think it does so I rewatched the movie to see if I still agreed and whether the film still was as good as I remembered. After watching it again, I think it’s the perfect Christmas movie. It also has a great story that still works and action that is better than more recent films I’ve watched. To refresh all our memories of the movie, I’m going to do a quick recap. 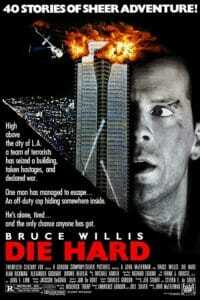 Bruce Willis stars in “Die Hard” as John McClane, a New York police officer that’s in Las Angeles to have Christmas with his wife, Holly (Bonnie Bedelia) and his two kids. Holly, going by her maiden name, Gennaro, went to Las Angeles because she got a great job opportunity so for the last few months, she and John have been separated. The whole office is having a Christmas party so Holly’s boss, Mr. Takagi (James Shigeta) has sent a limo to bring John to the party as a surprise. While John is cleaning up, a group of men, led by German terrorist Hans Gruber (Alan Rickman), invade, killing the guards, taking over the building security and computers and holding the party goers hostage. John manages to escape up into an unoccupied part of the building but he only has his service revolver and is in bare feet. With limited resources, he must find a way to save his wife and the rest of the hostages before Hans and his men kill them all. So why is this a Christmas movie? It’s not just because it’s on Christmas Eve at a Christmas party. Those are factors and certainly part of the reason it should be considered a holiday film. But that’s not my only reason for considering this one of my top holiday go to movies. For starters, one of the elements of a good Christmas movie is family. Most films about the holidays revolve around family and being with them no matter what. 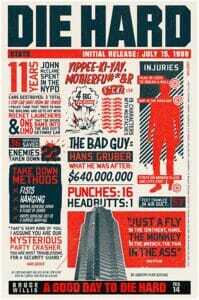 In that spirit, Die Hard most decidedly fits. John spends most of the film trying to save his wife and rescue everyone so he can be with his wife and children. At one point, he isn’t sure he’s going to make it but part of what helps him survive is the need to help Holly. That is the heart of what the holiday is about, being with family and helping them and Die Hard definitely wins on those counts. The other element of a holiday movie is mentioned in the film, as Hans and his men talk about Christmas miracles. They need one to get a vault open but in the end, the miracle works against the bad guys because John gets the majority of miracles. The first, he’s able to get the attention of a beat cop who helps him and brings in outside support. The cop, Sgt. Al Powell (Reginald VelJohnson) keeps John hopeful, being a support on the radio and at the end, helping John stay alive. During the movie, John is barefoot. Despite that, he manages to make it through, even when the bad guys use it against him. And it is no small miracle that he manages to evade them at every turn and defeat them. The movie is all one perfect miracle, one after another. As for how well the film holds up? The action is believable. Bruce Willis feels real as he’s punching the terrorists and running around the building. All of the action is based around him using the ventilation and inner parts of the building. Part of the building is under construction which aids him in this and the fighting never feels faked. John gets beaten up as well and it is reasonable as he manages to stagger out of the building with the support of his wife. There is only one stunt that stretches believable and even it is more authentic than some movies I’ve seen recently. The story, the emotions shown between John and Holly are also authentic. While I don’t think divorce would be imminent over a wife taking a job halfway across the country today, I do think if she did it without talking it over with her spouse, you would have the same result as in the film. John doesn’t want to just quit his job and even today, that would be reasonable. It’s obvious the pair care about each other and those emotions show in the dynamic between the two actors. Even better, Holly gets to have an active part in the movie. She does get saved at the end but she does everything she can to save herself. And she gets her own action moment at the end. The writing is smart as the viewer tries to figure out what Hans is up to and it’s not as simple as just an act of terrorism. The story keeps you engaged, even if you’re familiar with the plot. The acting is just as true to the writing. Bruce Willis is believable as a New York cop. You see him watching everything, aware of every person around him. He comes across as tough and stubborn and his fighting fits the character. Bonnie Bedelia is smart, thoughtful and I love her composure. Her character isn’t some young girl but a seasoned, experienced business woman who is more than a match for John. Alan Rickman is one of the best parts of this film. It was actually a bit painful watching him, knowing we won’t see his caliber of actor again, with his passing in 2016. His accent never drops, he plays his character as ruthless, clever and motivated. You can believe him almost getting rid of John and he is the perfect villain, someone who has motivations you understand and someone you love to hate. Also kudos to Reginald VelJohnson. He was incredible as Sgt. Al Powell, full of heart and bringing in moments of humor to lighten the action sequences. He was also one of the best parts of this film. Overall, “Die Hard” is worth watching more than once and even now thirty years later, aside from some technology changes, this movie is completely works for me. The action is incredibly believable, the emotions real and the miracles do happen on Christmas. If you don’t believe me that this is totally a Christmas movie, go watch it yourself and see if you don’t end up agreeing.